If you follow my blog, you may know that SheppyBrew's 2013 goal was to have brewed all-grain batches of beer in all 23 of the BJCP categories (see SheppyBrew Styles). At the end of 2012, one of the missing categories was Category 1 Light Lager. I didn't really want to brew any of the American light lagers. I had been thinking of brewing a Munich Helles for quite some time. I like the crisp, clean easy drinking, low alcohol beer style with nice German malts. Every Helles that I have ever had has been very nice. So, it was pretty much a no-brainer that my Category 1 beer would be a Helles. The name "Helles" has all kinds of pun possibilities with "hell". Most of them that I came up with already had beers associated with them. Surprisingly, though, "Snowball's Chance" didn't yield any results on untappd. Seems like an obvious one, so I am snapping it up. Maybe I should trademark the name, but that just seems like too much work. "Snowball's Chance (in) Helles" was the first of a series of German lagers. I started with this one because it is the lowest in alcohol and lightly hopped. Next up was a Schwarzbier and then a Mailbock. I propagated the yeast from batch to batch. For this series I am used Bohemian Lager (Wyeast Labs #2124), which Wyeast told me is appropriate for all three styles. By the time I got to the Maibock I had plenty of yeast to pitch into the high-gravity wort. For what it is worth, Helles in a Hand Bock-sket won a first-place award in a local competition. I added Clarity-Ferm to this recipe to Kill the Glutens. I bottled this batch, and somehow completely screwed up the carbonation. I tried to recover, but never really got this beer where I wanted it. I did enter this beer into the 2013 National Homebrew Competition. 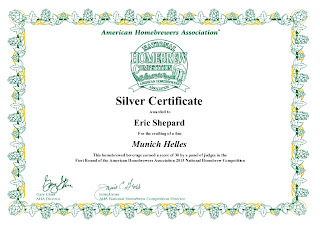 It did alright, winning a "Silver Certificate", which basically means nothing, but I guess is technically an award so-to-speak. Batch 2 was exactly the same as batch 1 except that I kegged the batch rather than bottle it. A day or two before brewing, make a 1 liter starter. Ferment for 1 week as close to 55 as possible. After 1 week, let temperature rise into mid to upper 60s for a week or two. Keg. If desired, save the yeast to use in another batch of beer. Bought ingredients today at the Brew Hut. Should brew Sunday. Brew day today. Everything went well. 1.046 OG. Over cooled the wort. For down to around 40. Let it warm up a bit at room temp. We'll see how it turns out. End of day. 58. Still going. Bubbling practically stopped. Took out of ice bath. Still very cloudy. 66. Forgot to mention 1.046 came to 11.1 brix. Kegged today. FG 1.008 puts this beer right at 5%abv. Very good. May be a bit hoppy for style, but delicious. Still a bit of a yeast haze. Put keg in beer fridge. Hopefully it will clear up soon. First taste. Good light German lager. Really been a great beer. Like the Nobel hop flavor. Nice pilsner malt character. Don't think this will last too much longer. Clarity on this is awesome. Flavor too. This batch is so much more awesome than the last.